So if you want to add your own syntax highlighting files to Kate/KDevelop, then you have to use the new location. By the way, in former times, all syntax highlighting files were located somewhere in /usr/share/. However, since some time, there are no xml highlighting files anymore, since all xml files are compiled into the KSyntaxHighlighting library by default. This leads to much faster startup times for KTextEditor-based applications. If you build Kate (or KTextEditor, or KSyntaxHighlighting) from sources and run the unit tests (`make test`), then the location typically is /$HOME/.qttest/share/org.kde.syntax-highlighting/syntax. in the recent months, I didn’t find much time to spend on Kate/KTextEditor development. But at least I was now able to spend a bit more time on OpenSource & Qt things even during work time in our company. Normally I am stuck there with low level binary or source analysis work. For our products, we were in the need of some online help. 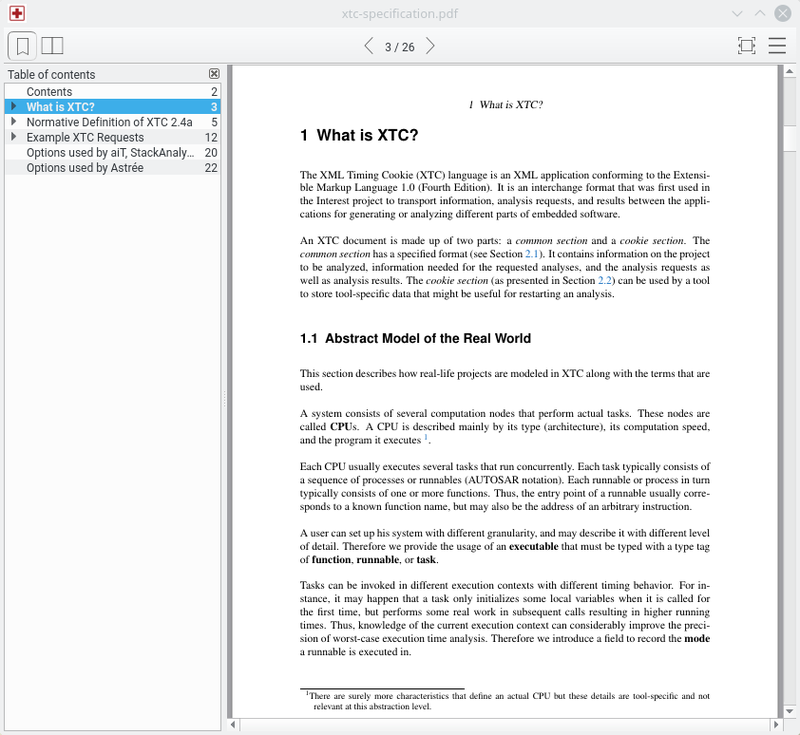 As our documentation is delivered as PDFs generated by the tools of the TeX Live distro, a natural idea was to use some PDF viewer and integrate it more tightly in our software than just “open the manual at page 1”. We did review PDF viewers out there, but most (like Okular) have too many dependencies to be just bundled with our product (or a license not permitting that). Without bundling, we can’t ensure that the tight coupling is working, without starting to test the integration with X different viewers which more or less all need other kinds of command line arguments to open the right page or even lack that feature or will not reuse an already running instance, …. Therefore, as our GUIs are developed with Qt anyways, we did take a look at libpoppler (and its Qt 5 bindings), which is the base of Okular, too. Easy enough, taking the small demo program shipped with the library and adding a small stdin based interface to tell it “goto <named reference>” we arrived at some small PDF viewer that is fit enough for our use case. We named the thing “FirstAid”, the sources can be grabbed at github.com/AbsInt/FirstAid. Like libpoppler and the demo, its licensed as GPLv2+. As already the README states, the aim of this small project is not to replace some full fledged viewer like Okular, the design goal is to have a small viewer that is auto-started by some host application and will jump to the requested labels for a tightly coupled online help. It can be used as a pure standalone PDF viewer, too, but that is more intended for testing it e.g. on the documents that should later be shown as online help. I already annoyed Albert with some small issue I had with libpoppler, perhaps I will provide more useful fixes in the future if more things come up during FirstAid development. In any case, already THANKS A LOT for the Qt 5 bindings around libpoppler, they work nicely for us! I really think this small project shows the benefit of OpenSource: We needed a PDF viewer, we were able to create a small one in less than a month based on OpenSource libraries and we can give back the results to the community (if it is useful for others is a different story, but perhaps other people have the same itch to scratch, if not, ignore it). I hope more possibilities for such things come up at work in the future. For building: It should build out of the box if you have some recent Qt and libpoppler-qt5-dev installed, at least the Travis CI is able to build it out of the box with the given config. For me, it shows some small bugs if used with Qt 5.6/7 compared to the Qt 5.8 Beta I used here for testing.